A stylish Yakitori place in downtown Kyoto near Nishiki market, Torito offers Yakitori of standard parts of the chicken to rare parts such as cartilage, hips, and neck. They serve Yakitori of young domestic chicken and grilled on the charcoal grill referred to them as the “main stage.” There are table seats, counter seats as well as standing area where customers enjoy each other’s company with some delicious charcoal grilled Yakitori and drinks. Many locals stop by after work seeking stress-free place eating and drinking. Torito showcases soft lighting and well organized interior that customers can feel completely comfortable in. 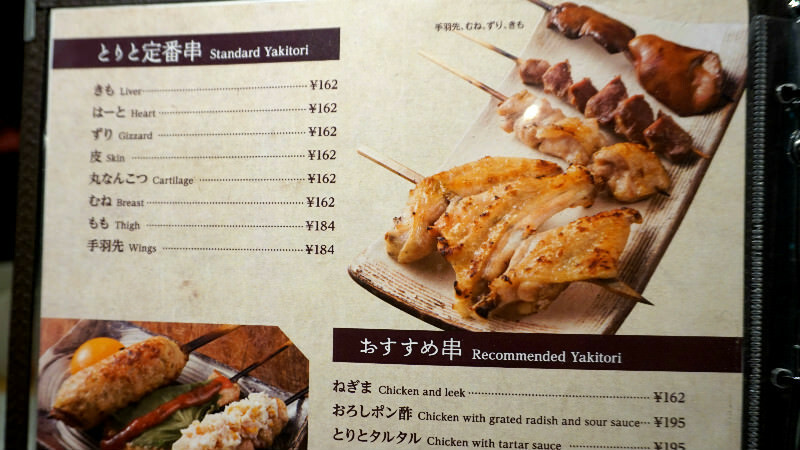 Torito offers parts that not all Yakitori places offer and are categorized in the “rare Yakitori” section of the menu. Out of 10 different types of rare Yakitori, we recommend the following four from left to right on the picture: Cartilage of breast, neck, ribs, and hips. The hips, or “Bonjiri”, is marinated and cooked with their original slightly spicy sauce. Note that 2 sticks or more per type must be ordered. You can’t go wrong with the common parts of the chicken. 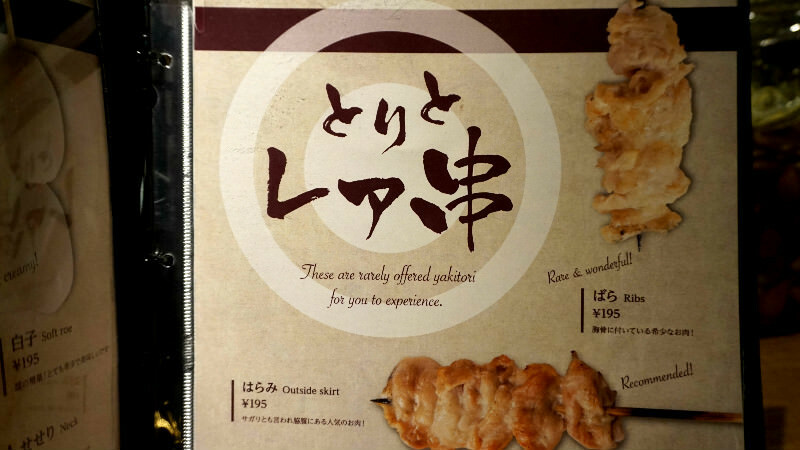 Under the “standard Yakitori” section, 8 different types of Yakitori are listed. From left to right on the picture is: skin, heart, and wings. Other types include under the standard Yakitori on the menu are breast, thigh, liver, amongst others. The drink menu is superb at Torito. You will find lists of cocktails, whiskey, beer, wine, and sake. 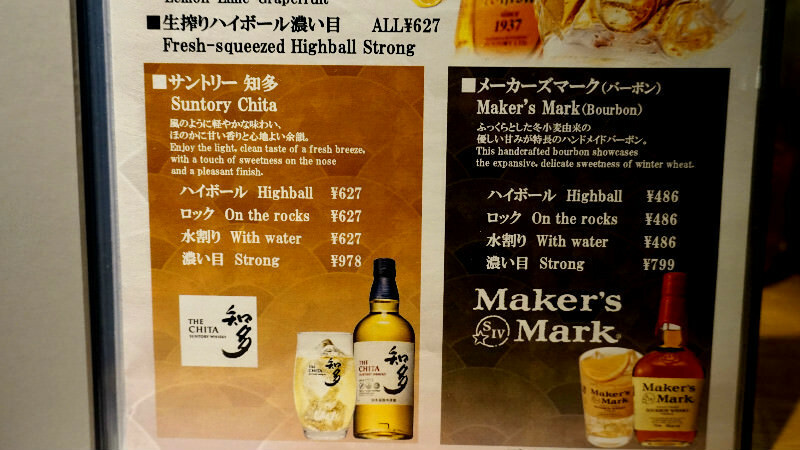 We recommend the Suntory Chita highball (Chita whiskey and tonic) and the Yamazaki plum wine from Kyoto. Torito is an ideal place to try these highly reviewed drinks that was recently released in 2015. It is customary to order a drink once you are seated. Note that receiving the “Otoshi,” or a small appetizer, with a drink is common in Japanese Izakaya establishments, and a small fee will automatically be charged. Grilled Onigiri, or rice ball, has smoky aroma from the charcoal, and it goes very well with Yakitori. It comes with pickled vegetables on the side. The Onigiri is grilled with soy sauce creating a toasty brown color, a delicious bundle of rice! ￥350 will be charged as a cover charge per person. This includes a small appetizer. Keep in mind that 2 or more Yakitori must be ordered per type. The prices shown on the menu is for 1 Yakitori skewer. The ambiance is great at this Yakitori restaurant! I went to Torito around 6:30pm on a Tuesday, and the place was pretty calm. It's a place for drinking and would be easy to go in if you know the culture of "Otoshi" at Japanese Izakaya establishments. I was happy that Suntory whiskey Chita was on the menu which went very well with all the Yakitori I ate. It's a very nice place to go with a friend and enjoy some Yakitori and drinks. Reservation calls are accepted from 2pm during restaurant preparation. Foreign language speaking staff is occasionally on-site.